My posting has been infrequent as of late, due, in part, to obligations concerning a family member’s hospital stay. So, since I have a short time before I have to rush off to run errands and make visits, why not focus on a historic Dallas hospital? 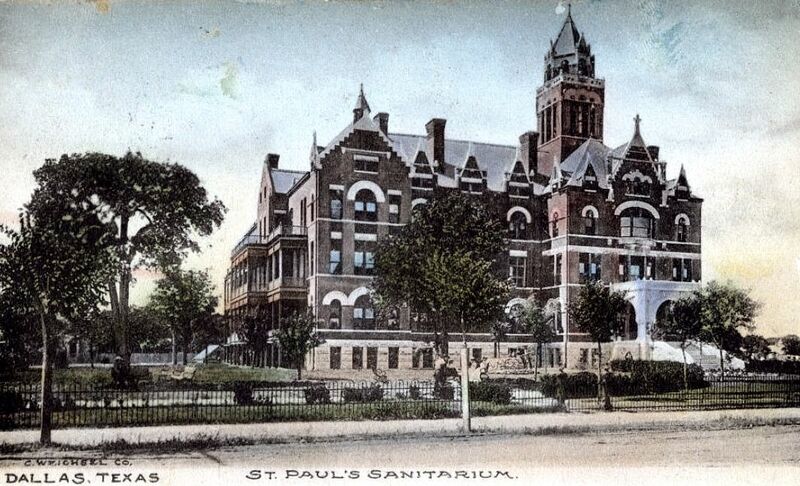 St. Paul’s Sanitarium was opened in a small cottage on Hall Street in 1896 by the Daughters of Charity of St. Vincent de Paul, but it soon moved to the new large H. A. Overbeck-designed building on Bryan Street in 1898. 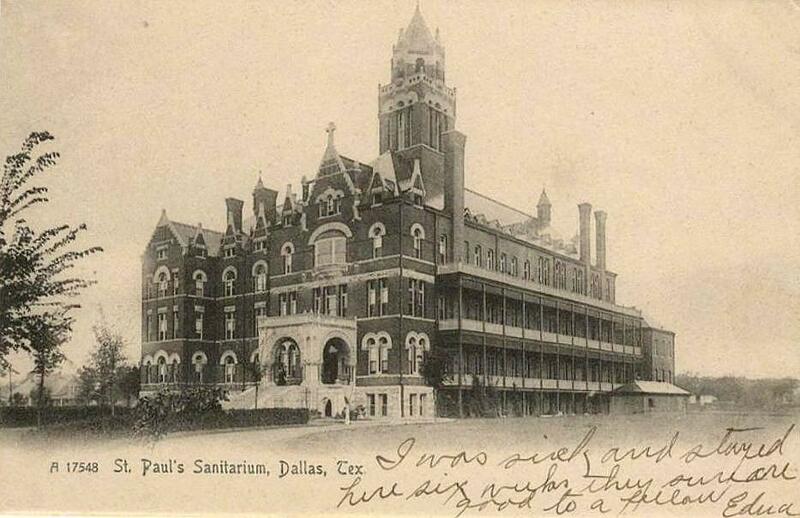 In 1927 the name changed to St. Paul’s Hospital, and in 1958, the name changed again, this time to St. Paul Hospital. The imposing building and annex (and whatever other structures were contained in the complex) were demolished in 1968. Below are several wonderful photographs taken inside the sanitarium around 1910 by one of Dallas’ best photographers, C. E. Arnold. 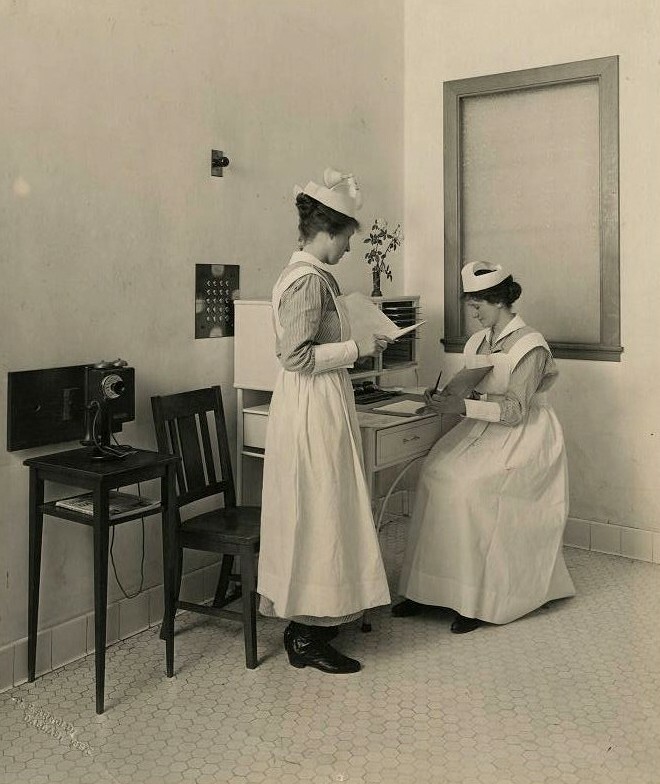 They are from the St. Paul Hospital Collection in the UT Southwestern Library (click links below photos to see info about each picture). The “Mexican Ward” (as noted on the back of the photograph). 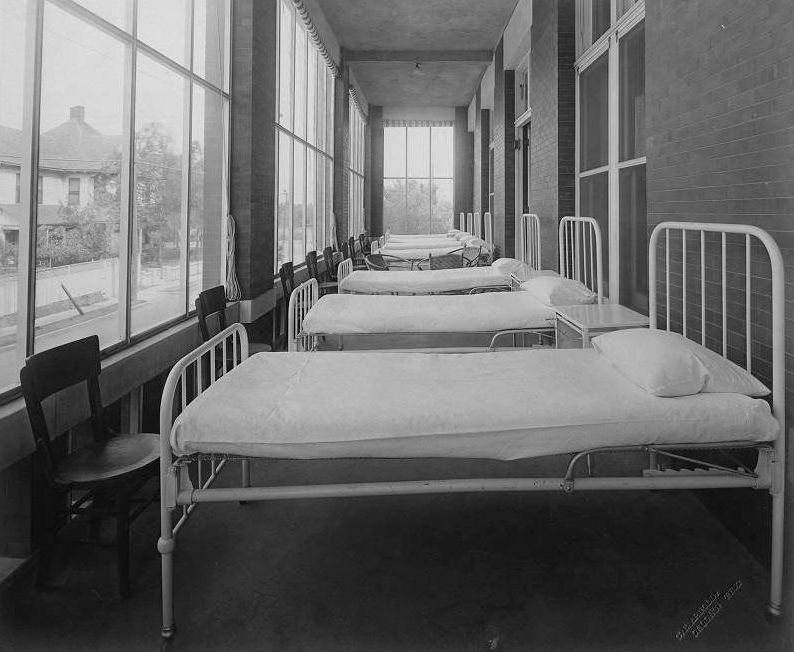 A patient ward on a screened-in sleeping porch. 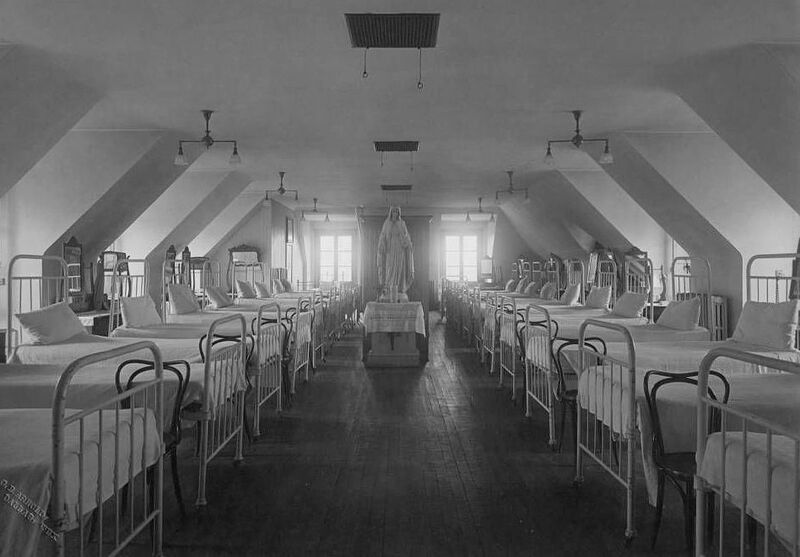 The nurses’ dormitory on the top floor. 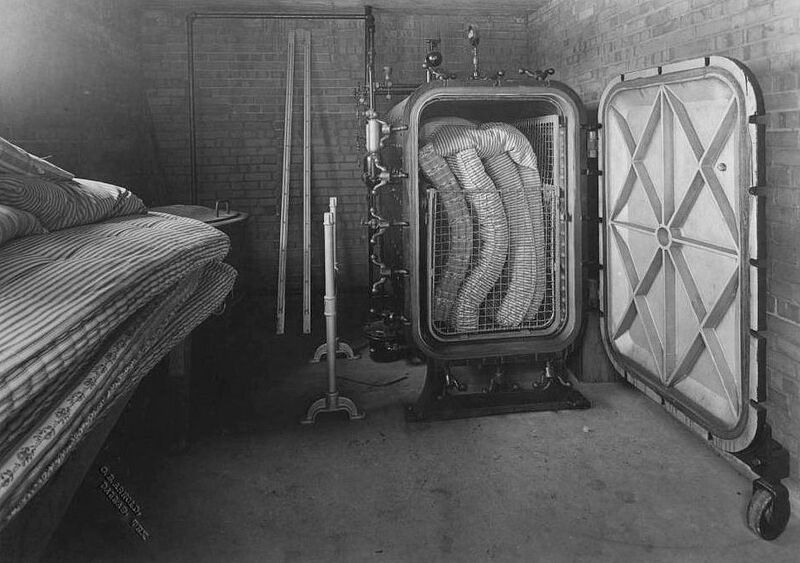 And, my favorite, the ominous-looking “mattress sterilization room“ in what appears to be a dungeon. 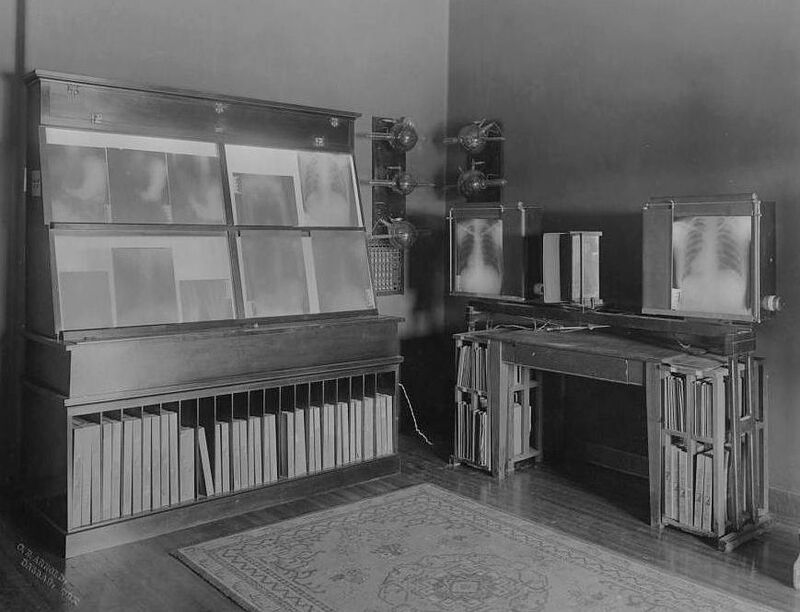 UPDATE: Check out some fantastic historic photos of the hospital and its nurses contained in this UT Southwestern Medical Center publication, “St. Paul University Hospital, A Legacy of Caring,” here. Top postcard is from the Vincentiana Postcard Collection, Special Collections and Archives, DePaul University Library, Chicago; it can be found here. Bottom postcard, with the cheerful message from Edna, was found on Flickr, here. 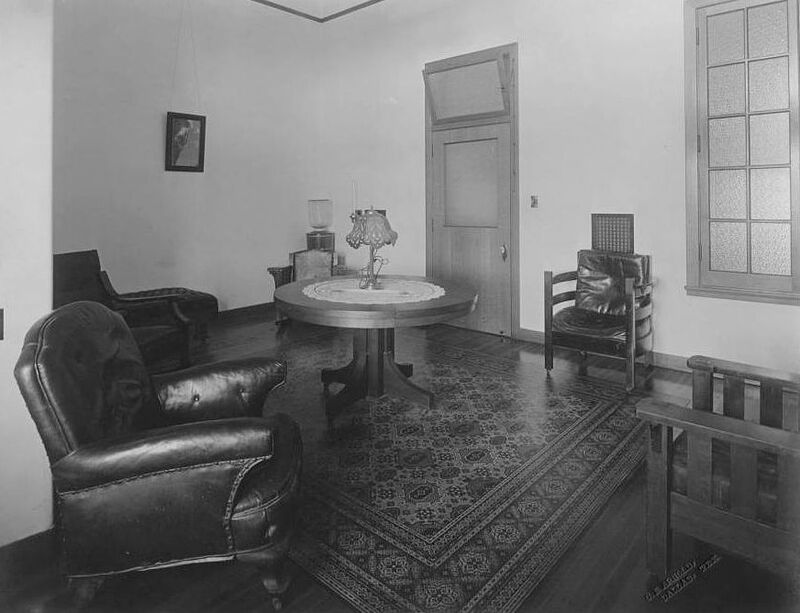 An interesting article on the photographer, Charles Erwin (C. E.) Arnold, and the technique used in capturing his interiors, can be found here. A historical timeline of St. Paul’s can be found in a PDF here. 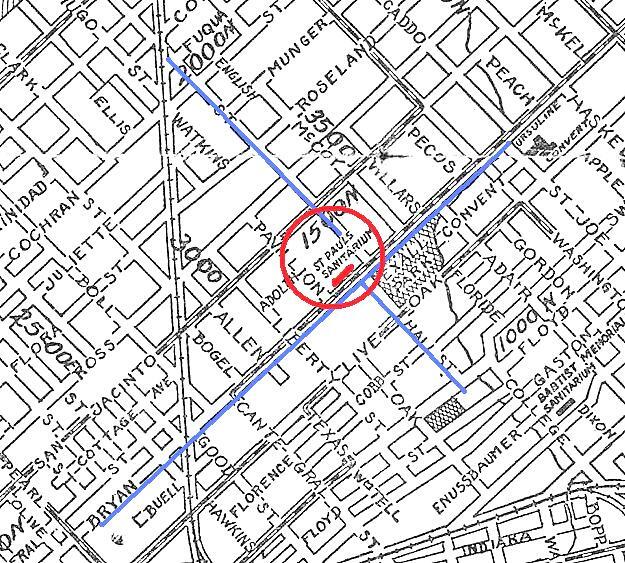 Great pix & info, Paula – a look at google maps seems to indicate that the intersection of Bryan and Hall no longer exists, and that the site of old St. Paul’s bears no resemblance to what it once was. Thanks, Steve. Yeah, it’s hard to believe that the hulking St. Paul buildings were ever in that Bryan Place neighborhood. The equally large and imposing Ursuline school was also nearby. Very nice write up Paula and great photos! My wife was born at old St. Paul Hospital and she was equally impressed. It is hard to imagine that a large hospital was ever at that location based on what is there today. I know it was because I remember it and I remember taking part in a disaster drill at St. Paul in about 1956 where a bunch of Cub Scouts were used a disaster patients. I got treated for a broken arm and leg and then treated to soda and cookies when the drill was complete. Thanks for the memories. Thanks, Danny. I had completely forgotten until after I’d written this that my mother was born there. She remembered the nuns, quite a sight, one imagines, for children not brought up in the Catholic faith. 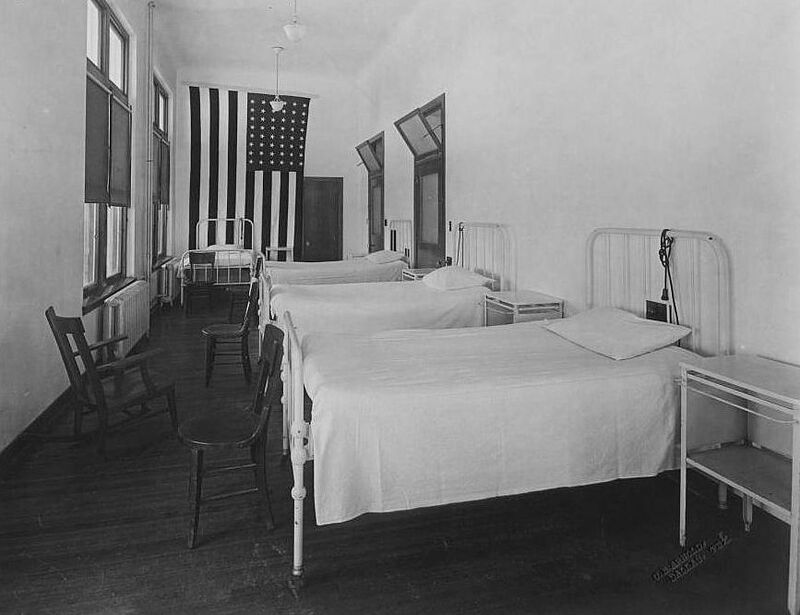 I have a photograph of when my great grandmother was there in 1912,it was a very good hospital…and that is what you should realize is that Dallas has had some very good private Hospitals history…..while the public hospitals or county are indeed sad…..this was torn down in the 70’s for the Fox and Jacob area renovations…and that was an old catholic and Italian neighborhood….this is a hand colored Weichal card, it appears that Charles Arnold had taken…while the interior shots are very rare, I have never seen….Catholics made the best hospital workers…..since the spiritual involvement is about care …. Arnold’s photographs are remarkable documents, all the more so since they seem to have been done with natural light. 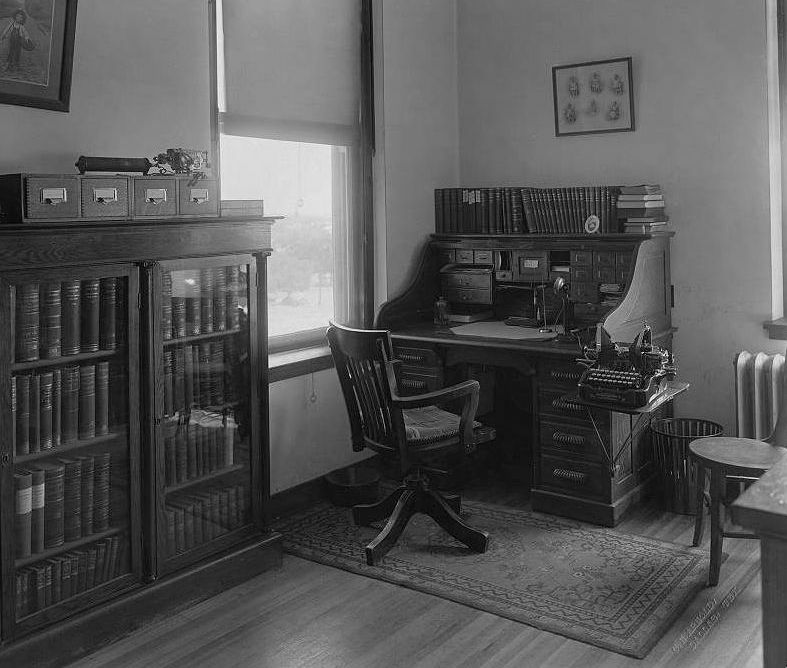 …Carl Weichel, who ran the various Drug stores at the time and had paid Arnold to capture these images, was the man responsible for the many first post cards images sold in Dallas drug stores and later other towns and places…. and at the time and Arnold had to have a special camera in box form and a stand, tripod to do this kind of slow work…..with glass negatives….. The real photo, post cards are also from this era and made from a camera you can carry on the street and this also became the popular couples on a street protraite shot….or single shot s that was in vogue even up to the 1950’s….Very little history has been told of this mans life and yet that is where the first and best cards came from…. Peter. now 97!!!!. any records? Hello, Mr. Plotkin! I found a few mentions of your father and his artworks in the Dallas paper, but nothing lengthy. I did actually see your birth certificate, though (via Ancestry.com), and not only is it missing your first name, it’s missing ANY name! I saw the replacement birth certificate requested from California to add your name. Sounds like that was a story you’ve carried around with you your whole life! I looked at the site you recommend and there is still a need to really tell a story that has that dynamic version of how he did do the work he did do when it was a very hard challenge to view and capture such images, he really did not make much money from the adventure and yet captured some 400 images more ore less…..his colored images of Trains on the crest of a ride are by far the best was were his Interuban shots…..
Was there ever a fire there? I am trying to track down my grandmother’s birth certificate from June 25, 1912. Her info was cryptic, but she said she was born at Mercy Hospital in Dallas and that it burned down and that’s why she has no birth certificate. My grandmother was sketchy with facts but I so much want to confirm who her parents were. I know who she said she thought they were, but I would like to see a birth certificate to confirm. This is the only hospital that “loosely” could be what she was referring to. Can you help? Are there any records? I did a quick check of the Dallas Morning News archives and I couldn’t see references to a “Mercy Hospital” in Dallas. There was a 5-alarm fire at St. Paul’s in 1951, but the hospital did not burn down. As far as I know, birth certificates are filed with … the county? Even if the hospital burned down, there would still be a birth certificate on file in a county office. Have you checked out Ancestry.com? Oftentimes you can view a scan of the actual birth certificate. Good luck! Paula, thank you so much for these interesting facts about the hospital. My little friend and I used to sneak into the beautiful nun’s garden behind the hospital about 1944 or ’45. We were in the 1st and 2nd grades at San Jacinto Elementary. I lived on Life Oak. There was a pond with wooden swans and lilly pads, flowers, shrubs, grass and tall trees. One day a nun caught us and said we must be the little girls who were scaring her “fishes.” We moved to the front of the hospital where we would slide down those slick marble(?) banisters. Exall Park was another one of our playgrounds of course with swimming in the summer. Two rectangular concrete fish ponds were at Exall and would freeze over in the winter. From your information, I learned two of my children were born at St. Paul’s ’56 & ’57, and my daughter was born at St. Paul ’60. I never knew the name changed.